Poor Betty. Photo: © AMC Network Entertainment LLC and Lions Gate Entertainment Inc. All Rights Reserved. This post contains spoilers of the final episodes of Mad Men. Your eyes shouldn’t cross this line. 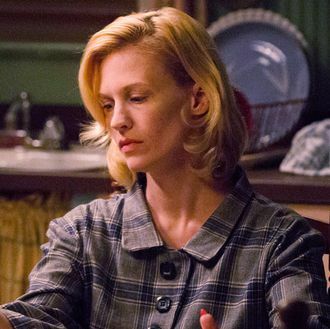 According to Weiner, Betty’s death was all but solidified once AMC signed the show on for 36 more episodes after a contract dispute that delayed the season-five premiere of the show was settled in 2011. After that, Weiner said he also knew the “Hilltop” Coke ad would appear on the show, but as for whether he knew Peggy Olson and Stan Rizzo were going to live happily ever after? “That had to be proved to me,” Weiner said.